Meshninety. 2017 © All rights reserved. Process waste (or muda, (無駄) a Japanese word meaning “futility; uselessness; wastefulness”) is a key concept in the Toyota Production System used to describe any process that consumes resources or time, but doesn’t add value to the customer. Process waste is a vampire that feeds on time. It is the evil that Meshninety is intent on banishing. By helping businesses identify and remove waste from their processes, we improve their efficiency and profitability, and give back the time that it greedily consumes, so it can be used to make the business grow, or just enjoy life. The ‘7 deadly wastes’ as defined by Taiichi Ohno, Toyota’s Chief Engineer until 1990, are listed below, along with the idea of ‘non-utilised talent’, which has been added more recently by many authors. Note the DOWNTIME acronym. While the concept clearly has its roots in a large-scale manufacturing environment like the Toyota production line, our stake through the heart is pointed at the five key aspects that we see time and again in organisations of every size. See below for what to look out for, and the garlic you need to ward them off. Defects turn up as errors caused by manual data entry and manipulation, leading to mistrust of information, and a lot of time wasted to working out whether the numbers are correct. I have known organisations to spend entire meetings deciding whose are right, when the meeting is meant be about making decisions based on the data. This not only wastes time, but also delays the decision making process and impacts the ability of the business to react at speed. The key to avoiding defects is automating the flow of information between systems, so the potential for human error can be removed. There are a number of tools available that with a small amount of configuration can extract, manipulate and combine information from emails, spreadsheets and a host of business management applications and deliver it where you need it. Our current favourite is Zapier. Non-utliised talent is where highly paid people make up for waste in a process by carrying out simple routine tasks that do not require their expertise. This is the most expensive, least effective defence against vampires. Not only does it cost money, it draws important people’s brains away from the things they’re good at that make a real difference to the business. And, it can frustrate the hell out of people who signed up for an interesting job and end up stuck in the weeds. Automation is also the key to to avoiding under-utilised talent – by setting up the right triggers and actions within the process, we can make the systems do repetitive tasks automatically when they are requires, and let the people do some thinking, like their brains were designed for. Inventory can be anything that is stockpiled at any stage of a process. Of most concern is the stockpile of work that needs to be done. A process that relies on a ‘push’ model to move work along, and failure to effectively limit the volume of work in progress leads to bottlenecks that keep those further down the chain waiting, and can cause massive delays in the overall process time. We combat this through lean process design using ‘pull’ models and task management systems that allow everyone to see where work is accumulating, so they know where to help. Have a look at Trello and Leankit for a couple of good examples. Unnecessary motion is caused by the need to access multiple systems or work through poorly organised data to the get to the information the business requires. This means a lot of time wasted on ‘reporting’, when the information could be immediately available. Motion is like the flip side of the defects and can be dealt with in a similar way – by automating the flow of information, we can avoid the pitfalls of data entry at one end, and save time on reporting and presenting information at the other. Extra processing describes the steps in the process that add no value to the outcome. The most common examples I have seen are the running of reports that no one looks at, and the insertion of approval or review steps instead of making sure things are done right the first time. These steps are the plain definition of time wasting and the places where the lurking vampire feels most at home. They can be tricky to spot, but often come into sharp relief when the process is viewed as a whole and we can see the contribution that each step actually makes. In this case the best defence is some good old fashioned brown-paper process analysis to highlight which steps waste time and which don’t. 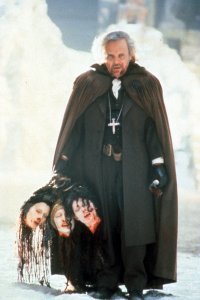 After all, that’s what Van Helsing would do.